There’s nothing like a great tasting MEATLESS salad. I am all over eating meatless and I do love my seafood. The recipe I am about to share with you for the Zesty Lime Shrimp Salad has a nice tang for those of you who like lime and as an avid fan of Frank’s Hot Sauce I have to tell you sauce makes a great addition for anyone who loves just enough heat to brighten a dish up. I find that being able to simply defrost a shrimp minutes before a meal makes it a very doable recipe any day of the week. Get ready to taste your shrimp in a lavish new way and celebrate lime as it really zips up the dish. OF course you can change-up some of the veggies or even add-in extras just enjoy. Weeknight meals need to be simple and this salad takes a few minutes or less to prepare. Shrimp is always a beautiful dish to offer to guests and this ingredient combination lavishly lets you live a meatless meal out loud! I prepare this by the single portion, so you can adjust this for your own crowd. A few quick hints before we start so you get the lavish presentation! Fresh squeezed lime is best for that pulp taste throughout, however, you can easily sub in the refrigerated lime juice, but you will need to adjust as you go. A Lime Press will get all the good lime juice out and keep the seeds behind! Take a look at a LIME Press here. The Lime Squeezer is so easy to use and a great gadget to have in the drawer. Garlic salt, not Garlic Powder for seasoning. Cooked LARGE Shrimp are best, but you could sub in salad shrimp, just make sure to chop the veggies accordingly so things look balanced. Thaw the Cooked Shrimp, Drain, take off tails, rinse, and chop into 3-4 pieces. Clean Celery, by first peeling the ribbing off the celery and then cutting it into small pieces, do make sure they are easy enough to still be 'tined' by a fork. Peel Cucumbers, and cut into small pieces. Rinse the lime, roll on the counter to get the juice moving in it and then cut in half. 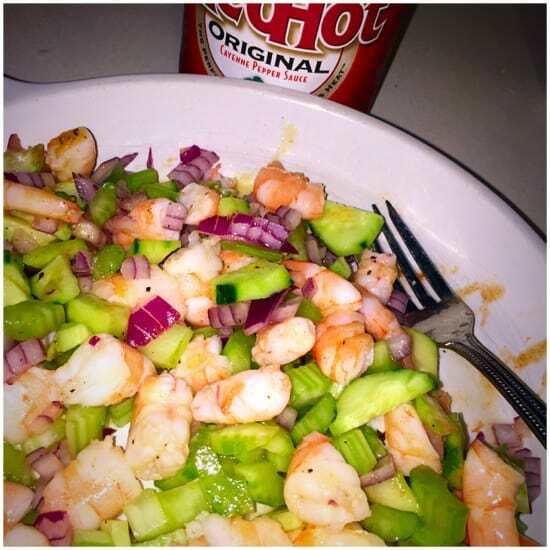 In a medium-sized mixing bowl add the shrimp, celery, red onion, cucumber, garlic salt, milled pepper, Olive Oil and Take 1/2 of the lime and squeeze it into the salad. Add in Hot Sauce 1 Teaspoon at a time until achieving desired heat level. Zesty Lime Shrimp Salad can be served up on a plate, or on a bed of Pastina, Orzo or atop CousCous for added heartiness. Romaine Leafs of lettuce are perfect for presentation while butter crunch leaves will allow you the ability to roll up a great meal. To change up the flavor or give it a hint of ‘Greek’ add in Feta Cheese and a few tomatoes and Kalamata Olives. Get ready to lavishly life shrimp out loud as you create an easy-to-make recipe that is fast to make and decadent to dine on! I love shrimp in salads and this just looks wonderful! Oh yes please! And being pregnant I want fresh, cold and crunchy things to eat! Fun recipe and a fun spin on salad! I’m not a seafood fan, but I bet it’s delicious! Ohh, really looks delicious! I bet my mom and my hubby would love this salad, I wish i could try this at home. I love your zesty lime and shrimp salad recipe! It’s the perfect dish for me to serve this weekend at a BBQ party! Thanks for sharing! What a delicious looking salad….and healthy too. It’s easy to whip up – perfect for a weekend lunch with the hubs! 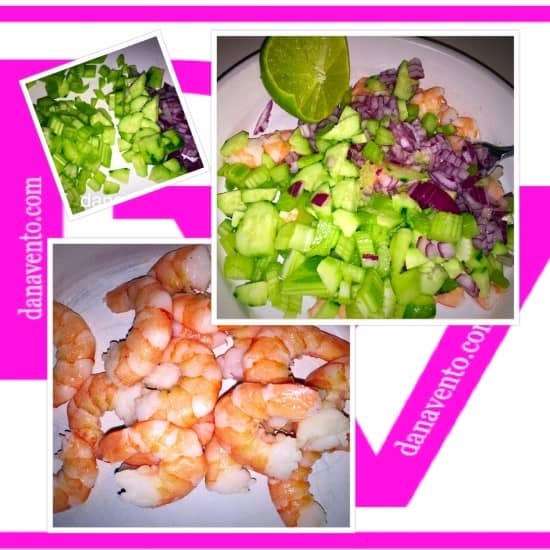 How fun to add lime to a salad with shrimp. The giveaway is great too! I am really drooling over this. Love this recipe. Looks really yummy! This salad looks absolutely delicious! I’d probably add some avocado because I love the combo of shrimp, lime, and avocado! My husband would just devour this salad. He loves shrimp anyway he can get it. This looks so yummy! Looks like a delicious salad worth trying! My family loves shrimp and I am sure they will devour this in seconds. Thanks for the recipe! Yum! This salad looks amazing! I love shrimp! Oh this looks really delicious. A recipe my husband would really enjoy! Shrimp is one of my favorite seafood items. It looks so good with the lime!! 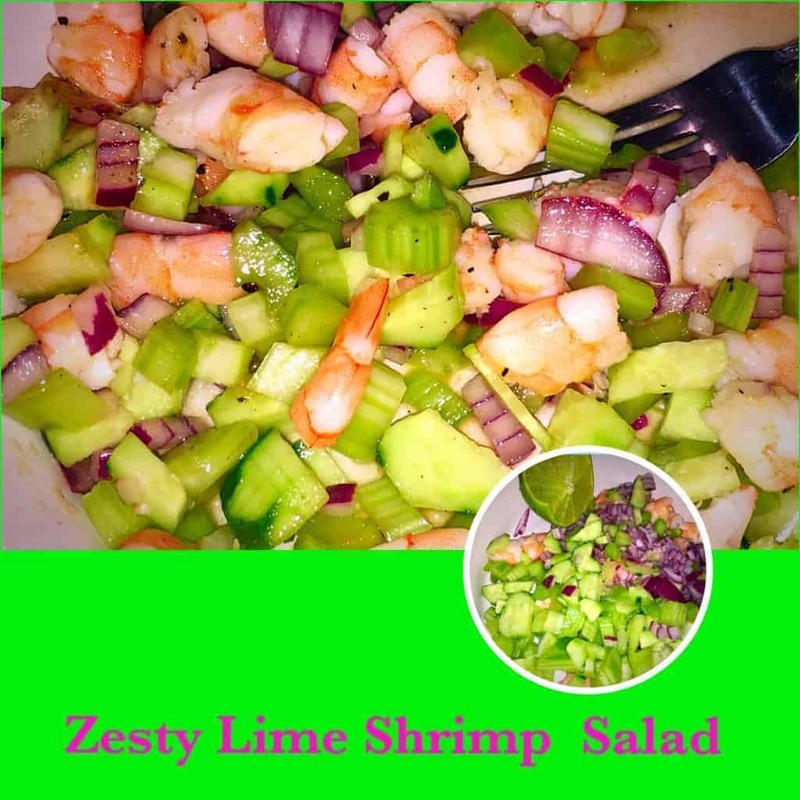 Thanks for the great recipe for zesty lime shrimp salad. I like that it can be made quickly. The hints your provided to make it just right are appreciated, too. I think the family will love this salad. Omg looks like a great salad and I love the shrimp on there. I can’t wait to try this. Omg looks like a yummy salad and i love the shrimp there. I can’t wait to try this at home. I love the ingredients, especially anything to do with lime! I’ll be stopping by a chef’s kitchen later for my travels and I’ll recommend this one for our dinner later. This is perfect for Cinco de Mayo! I love lime and shrimp together, they just go so well and the lime brings out the “flavors” of the sea! This is definitely a must try recipe for me! I love the combination of citrus and seafood. I feel like it really brings out the freshness of the food and has a great flavor profile. Cindy Ingalls recently posted..Meet the NEW Neutrogena Healthy Skin Anti-Aging Perfector! I really want to try making that shrimp salad. It sounds light and refreshing! Love to make shrimp dish once a month mainly homemake fried rice. But I’ve never try it in a salad. Your recipe made simple to try. My salad like a lot of spice…Pepper with Zesty lime a winning meal. That sounds delish! I can’t wait to make this for my family. This looks really good! I am going to have to try it! Thank you for posting your recipe! That is fantastic! I love shrimp, and all those veggies look so crisp and delicious. I’ve got to try this. This salad looks so light and fresh. This is perfect for summer! This looks so good and perfect from the spring and summer months! I’m saving and replicated for an upcoming party. This came at the perfect time! I was just looking earlier today for a new shrimp recipe. This looks so good! OMG!! I love shrimp that is my favorite dish ever!! Looks like a really nice salad. I love eating salads in the afternoon, as a snack. This would be a nice addition to my salad recipes, thanks!